NI ROCKS - Hi Brittney, thanks for taking the time to answer a few questions for Rock Radio NI. 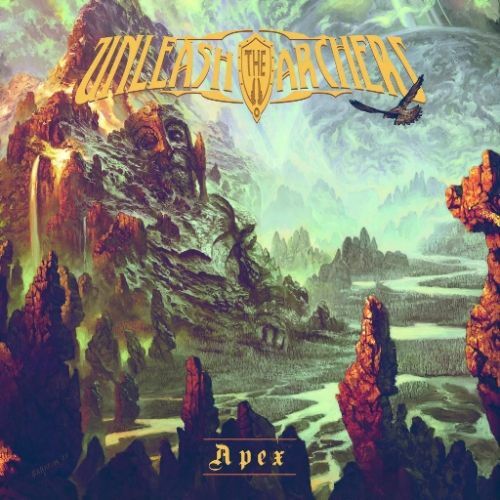 Unleash The Archers have just released their fourth studio album called “Apex” through Napalm Records. Can you tell us where the album was recorded and who you worked with? BRITTNEY – We worked with Jacob Hansen from Hansen Studios in Denmark. We flew over there after our European tour last fall and just kinda lived in a little house in the countryside down the street from the studio for three weeks. We also actually worked with his assistant Jonas. We lived there for three weeks. It was awesome. NI ROCKS - I‘m not a big fan of applying genre labels, but the two albums with Napalm have seen a distinct change in the band’s sound compared to the earlier albums. How would you describe the band’s music? BRITTNEY – I just call it heavy metal. We tend to mix genres a little bit and take different styles and put them all together into one. I agree with you, genres are just boundaries on music, so we tend not to try and fit into one particular sound. I just tend to say that we play heavy metal. I agree though that the last two records have changed quite a bit. Our writing force behind everything changed in 2013 when we welcomed Andrew onto our team. It is definitely more of a traditional heavy metal vibe but we still like to throw a bit of melodic death, thrash and black vocals in there. NI ROCKS - In terms of song writing, who are the key players and is there a common approach to how tracks come together or is each very different? BRITTNEY – There is no-one who is like the driving force behind everything. We all write our own parts and we all write everything together. It can depend. Sometimes a song will start as a riff that Grant will bring to jam or sometimes Andrew will bring an entire song and we’ll rip it apart and keep bits and throw bits away and change things here and there or rearrange it all together. Sometimes I’ll ever send a voice memo with a vocal melody or chorus or something that I’ve got stuck in my head and we’ll write off of that. We all have our part to play and no-one writes anyone else parts. Sometime you can come up with a riff or something and say this is the drum part I was thinking for that or this is the rhythm part I was thinking for that, but we never tell one another what to play. We all have control over what we play up on stage because if you don’t enjoy what you’ve written then you’re not going to have a great time up there. NI ROCKS – I probably know the answer to this question. A lot of albums these days are recorded now with the artists never being in the same room. From what you’ve said though everybody was in the studio at the same time recording the album, rather than people sending stuff in? BRITTNEY – We did “Time Stands Still” like that, where we just did it all on our own time. I work a day job so I was going in the evenings. Grant and Andrew would be in the studio all day long and Scott would just do weekends. So it was very much like that, but for this record it was actually very cool to all be in there together. There was a lot of time, especially with my parts, where I was the only one in there and the boys were all hanging out and kicking back in the house while I did my sessions. But we would all come back together for dinner every night and talk about the studio and that kind of thing. It was a lot of fun. NI ROCKS – You mentioned that the band toured Europe last November, including a couple of dates in the UK I think. Are there plans for a return to Europe and any chance of some more UK dates or even Ireland? NI ROCKS - What was the highlight of that last European tour for you? BRITTNEY – Oh, I don’t know. I think the whole thing was a bit of a whirlwind. We had some pretty incredible shows. London was fantastic – had a real great time there. Met a lot of fans who had been listening to us for a while and drove quite a way to see us. That was really great. Also the show in Vienna was the same. We had fans who drove from all over the place to see us there, and people who had been listening to us since our first album “Behold The Devastation”. The whole tour was one big dream come true. NI ROCKS - The band has a reputation of releasing some great videos and the video for the first single from the new album, “Cleanse The Bloodlines” was no exception. Who did you work with on the video and how did the concept for it develop? BRITTNEY - We worked with Richard Olak from Brotherhood, which is the same guy that did the “General of the Dark Army” video. That was our single from “Demons of the Astro Waste”. We knew that we wanted this video to be one of those epic narratives. Richard is really great for that and he has a lot of contacts and resources in the film world. We went to him straight away and said here’s the album – we actually sent him our demo tracks that we’d done – and said we’re not sure which song it is going to be yet, but we’re leaning toward “Cleanse The Bloodlines” and was wondering what you could come up with as a storyline or plot. He came up with a few ideas and we back and forthed it together, he and I, quite a bit because I wanted it to fit with the story of the album, but I understood that it wasn’t necessarily going to be able to be exact; just with the budget constraints and that kind of thing. We came up with the idea together, of it being the matriarch and one of the sons and the immortal character and leaving it like that; and playing around a little bit with the overall story behind the album, but not making the song exact. I think it turned out alright. It was a crazy weekend of filming, out in the middle of freezing cold weather in northern BC, but it was awesome and we had a good time. NI ROCKS - We’ll play a track from the new album now and maybe we’ll start with “Cleanse The Bloodlines”. Can you tell us something more about that song? BRITTNEY – The album is a concept record with one story being told throughout. “Cleanse The Bloodlines” is where our protagonist and our antagonist meet for the first time. The protagonist is a character we call The Immortal and he has been awakened by our villain who we call The Matriarch. This is where they meet and she tells him what she needs him to do. NI ROCKS - You formed the band ten years ago now, back in 2007, along with drummer Scott Buchanan. Have you exceeded what you initial expectations were for the band or is there something that you still need to achieve? BRITTNEY – Oh yeah, we’ve got plenty of goals still. It’s just a take it day by day kinda thing. When you first start a band you are looking for some kind of success and you dream that you are going to be recognised on the world scene, but you never really expect it to happen. We’re still growing and doing what we’re do; keeping making music and making albums. I think we’ve still a lot to accomplish; in terms of, there are a lot of place we haven’t toured yet and a few festivals that are our big pie-in-the-sky dreams. This is no way the end or even a milestone, just keep on going. NI ROCKS - When you put the band together what were your influences or who were your influences, and was there a consensus on what you wanted the band to sound like? BRITTNEY – (Laughs) No, not really. We were all over the place and that I think was originally why we did the genre blending thing from the get-go. We were all very much influenced by different music. We were all kinda into metalcore and death vibe back in the day – All That Remains, As Blood Runs Black, As I Lay Dying - that kind of thing. But we were also of course listening to things like Iron Maiden, 3 Inches of Blood and Judas Priest. We just kinda threw everything together – there’s even a bit of Danzig in there. I still listen to a lot of death metal, but it’s more darker, droney stuff, and a little bit of doom and black metal. And of course there is always going to be my favourites – Maiden and Priest and that kind of thing. So it hasn’t changed too much, just maybe a bit of a diversification from death metal. NI ROCKS - The first two albums in 2009 and 2011 were released independently. Had you been looking for a label to work with or how did the connection with Napalm come about? BRITTNEY – In 2009 (“Behold the Devesatation”) we didn’t really shop it out. We thought this is our first real album, let’s just release it and see what happens. Then we toured it quite a bit and in 2011 for “Demons of the AstroWaste” we did shop it out. But we were young and still learning a lot. We had some interest from smaller labels and we did end up signing briefly with a small Canadian label but that fell apart – not our fault! We were totally ready to release “Time Stands Still” independently again and I don’t think we really shopped it out. We maybe sent in a few digital EPK submissions and then Napalm sent us an e-mail saying ‘are you guys working on anything right now’ and we were like, ‘actually we happen to have these two demos here that we could send you’ and it went from there. NI ROCKS - Is the deal with Napalm for a specific number of albums? BRITTNEY – It’s this weird thing called ‘options’ – they signed us for “Time Stands Still” and then the next three albums we have to offer to them and they say ‘yes’ or ‘no’. NI ROCKS - Digressing slightly, I’ve seen your name mentioned in connection with the Vivaldi Metal Project. Can you tell us about that project and what exactly your contribution was? BRITTNEY – An artist called Mistheria put it together. He contacted a lot of people. Pretty much everyone on the record is well known in their craft – cello players, violinists, vocalists all that kind of thing. He contacted me in regard to doing a duet with Fabio Lione on one of the tracks called “Winter”. Fabio laid down his vocals and then they sent the track over to me and I did choruses, a bridge and some backing vocals. It was really cool; it was exciting and an honour to be part of it with so many fantastic musicians who were involved. Hopefully I’ll get to do something like that again. NI ROCKS – That brings me on nicely to the next question. Have you done any guest vocals for other projects or bands and is that something you’d be interested in doing more of? BRITTNEY – I did guest vocals for a band called Dire Peril. They have an EP out called “Queen of the Galaxy” and that is the track that I’m on. They’ve actually changed around a little bit and the guitar player from that band (Jason Ashcraft) started a new project called Helion Prime which has just been signed to AFM Records, so maybe there might be some cool collaboration there in the future. Other than that, not too much. NI ROCKS - Which leads me on to the next question. If you were able to record something with any other vocalist who would it be and why? BRITTNEY – Oh wow! I don’t think I’ve ever really thought about that. I’ve always wanted to a clean / scream duet with a band here in Vancouver called Nylithia and they released an album last year called “Hyperthrash”. Their vocalist Kyle Scott is just face-melting. This guy’s screams are impeccable. I always wanted to do a duet with him and I think it would be cool to really put the screams right up there at the forefront with my vocals. We did that a lot back in the old days, but not so much anymore. I love that part of our band and the screaming, I don’t think, will ever go away, even though people might wish it would (laughs). I think one day I’ll bring him onto a record; that would be rad. NI ROCKS - We’ll get back to the new album again and play another track. I’ll let you pick one this time and tell us something about it. BRITTNEY – Well it’s the longest track on the album, but it’s my favourite, so I would love to hear “Apex” which is the last track on the record. It’s basically about The Immortal finishing his task for the Matriarch and kind of being emotionally drained and going back to his mountain, which is his home and following into this deep sleep where he dreams of freedom. NI ROCKS - The latest album was released on 2nd June and has been getting some great feedback. Have you been pleased by the reviews so far? BRITTNEY – Yeah. It’s getting a lot more exposure than we ever could have imagined. A lot of people are picking it up and having a listen; and that’s great. Reviews are always mixed, you can never put too much heart into them because it’s all just people’s opinions and some people can be pretty brutal. If you pay too much attention you might go crazy. I tend to just skim over them. If they’ve got some constructive criticism I’ll take it into account. As far as fans go, we’re hearing nothing but positive stuff, so we’re really excited about it. NI ROCKS – You’ve basically answered my next question which was about negative feedback. Do you take it to heart or can you accept that some people just have different opinions? The latter then just? BRITTNEY – Oh yeah, absolutely! (Laughs). Sometimes you just have to shut it all off and ignore it. At the end of the day you’ve got to listen to your fans. You’ve got to take into account what other people think, but we’re the ones doing the writing and we’re the ones that have to perform it, so what we think and whether or not we love it is really what matters at the end of the day. NI ROCKS – You mentioned earlier the European tour. When is that going to be and what other plans does the band have for the immediate future? BRITTNEY – Europe is going to be this Fall – October and November (see dates below). We’re hoping to do the US as well – maybe September or October, but that is proving a little more difficult. When it comes to agents and promoters it seems that everybody wants to book at the exact same time. So we’re finding that there are a lot of clashes with the European dates that are already booked and we might have to do the US in the Spring. Hopefully we’d like to do South America in the Spring as well. If possible, Japan and Australia are our hoop dream! NI ROCKS - Will there be another single and video released from the album and if so when? BRITTNEY – Not really a single, but we’re going to do a play-through video for one of the tracks and put that up on the personal page. We’ll do a big announcement for it and it should be a week or so; we’re just going through the edits and making sure we didn’t screw up too hard! (laughs). NI ROCKS – We mentioned earlier that it was the 10th anniversary of the formation of the band – are you planning anything special for that? BRITTNEY – Not really, I didn’t even realise it until Napalm actually mentioned it when we were getting all the press releases ready. She said give it a read and let me know if it’s alright with you. And of course the first line was ‘ten years of Unleash The Archers’ and I was like Ohh...right! (laughs). It’s 2017! Forgot about that! Probably not; just going to keep on keeping on. NI ROCKS - We mentioned musical influences earlier, but a question I always like to ask is if you can remember the first album you bought and first gig you went to? BRITTNEY – Well, I don’t think this was the first album that I bought, but I remember the first metal record that I listened to, that kinda changed me forever as a person. That was Megadeth – “Countdown to Extinction”, back whenever that was – 1992 or something. The first ever show that I went to was actually New Kids on the Block when I was like 3 years old; and I cried the whole time apparently as it was too loud. I don’t remember it in the slightest. NI ROCKS – Probably best! BRITTNEY – (Laughs) I do remember the second concert that I went to. I went to Alanis Morissette with all my best friends when I was about 10 years old – after “Jagged Little Pill” came out. That was a good show. NI ROCKS - And the last album you bought and last gig you went to? BRITTNEY – The last album I bought was the Iced Earth “Incorruptible” pre-order. The last gig I went too...I guess mine don’t count...would be Sabaton and Battle Beast here in Vancouver. NI ROCKS – You mentioned there that you’re from Vancouver in British Columbia. Any other local rock or metal bands that you’d suggest we check out? BRITTNEY – There’s a band from Alberta, which is just one province over called All Else Fails and they’re a really good death metal band. Also The Order of Chaos which is a female fronted metal band that we’ve toured with many, many times. I’d definitely recommend listening to them. Also our buddies Crimson Shadows from Toronto who are also on Napalm Records – they’re working on a new record; they’re a little quiet right now, but I love those guys and always try to plug them! NI ROCKS - That’s all the questions that I have, other than to ask you to pick another track from the album to play and to tell us something about it? BRITTNEY – I guess we could do the second single which was our lyric video on YouTube called “The Matriarch”. This track is our introduction to our villainess and just how badass she is basically. NI ROCKS - Thanks very much for taking the time to talk to Rock Radio NI. BRITTNEY – Thanks for having me, it’s a pleasure.